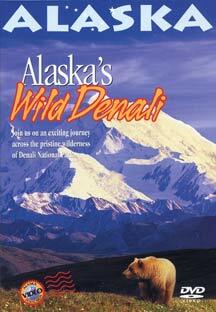 Join us on an hour long journey across the pristine wilderness of Denali National Park. This is an intimate, colorful portrayal of summer life in Denali. From the daily activities of its abundant wildlife, to the dazzling profusion of wildflowers, to the stunning flanks of Mt. McKinley, you will experience the many wonders of Denali National Park. Watch grizzly cubs at play under the watchful eye of their mother. See nomadic caribou herds foraging on the tundra. Look into the eyes of a lone wolf loaping on its daily hunt. Watch a mother moose and her twin calves forage in Wonder Lake. Alaska's Wild Denali is filled with a wive variety of wildlife and the breathtaking beauty of this crown jewel of Alaska. 60 Minutes.